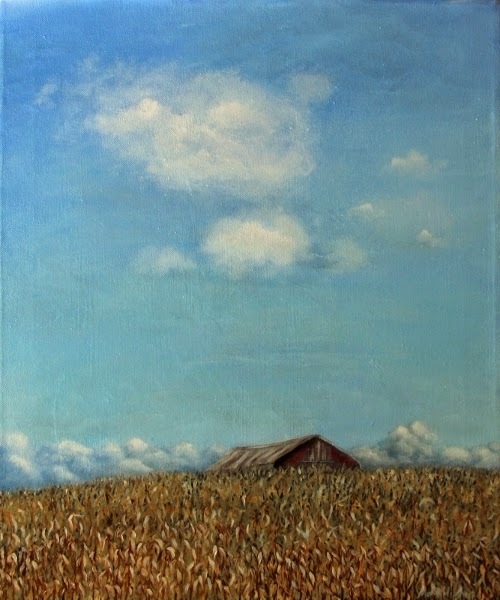 20" x 24" Gallery Wrapped Oil on Canvas: "Rolling Fields"
This is a Michigan farm scene. I've been impressed with the rolling fields some farmers work. I'm more used to the flat plain states. In this spot a distant barn peaks up over the hill in Western Michigan. Touches of blue on the autumn corn reflect the sky. You can purchase several that go well together and create a nice grouping! 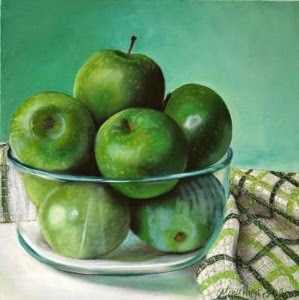 I have 4 different prints available in the apple series. These are also on sale right now, so this is a great time to group prints!! 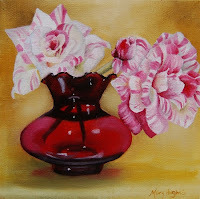 Post by Mary Hughes Studio. Available here this weekend only with FREE shipping! A swirly pink and clear glass vase hold soft pink peonies. 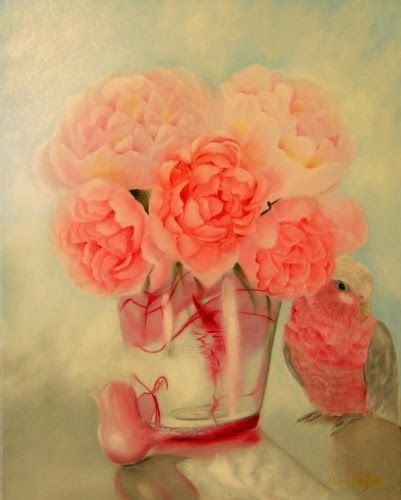 A pink glass bird gets a once over by a Rose Breasted Cockatoo. This painting is pink, not peach or coral. Your monitor may change the color slightly. Available on Etsy. Pretty green glass cherry creamer by Northwood filled with red roses. The canaries attention kept them from seeing the beauty in their midst. Purchase information for this print and 31 more are available on my website. 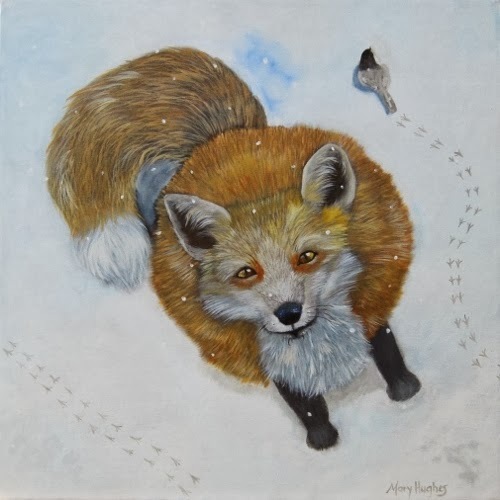 Fox and Chickadee Oil Painting 20" x 20"
"The Fox and the Chickadee"
A chickadee leaves footprints in the snow as he hops around the cute fox. Snow gently falls. This is a soft painting. Original oil paintings, prints and portrait commissions available on my website. 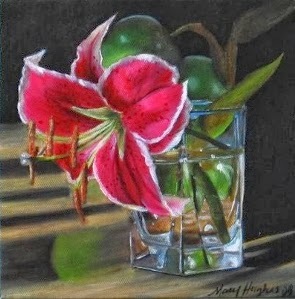 Buy 3 food or still life Mary Hughes prints any size and get the 4 (same size) free! Visit my website for prints available. 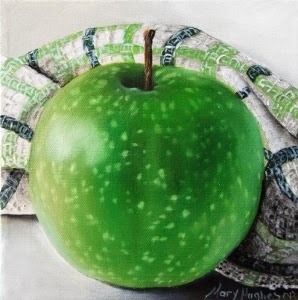 Contact me for price information on prints larger than 8" x 8". 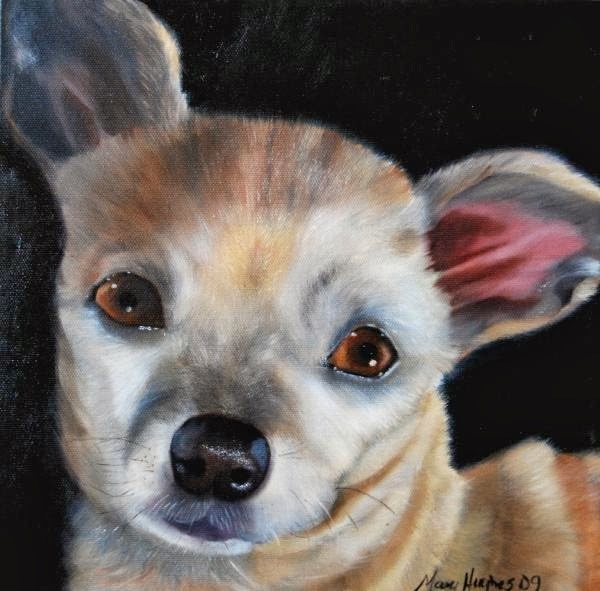 NEW Small Dog, Pet Portraits at a Small Price! 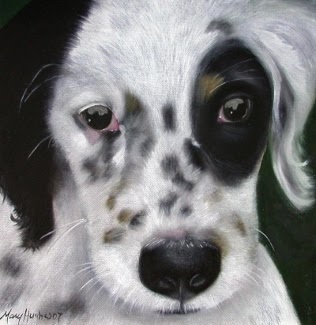 NEW, small dog (any animal) portrait for a small price! Sizes start at 8" x 8". Also NEW, memorial pet portraits on wood!! Visit http://www.maryhughesstudio.com for complete details!! 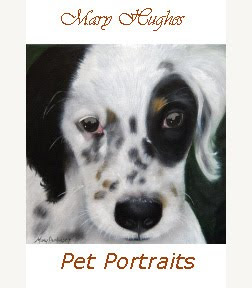 Come visit my new "prints" section on maryhughesstudio.com. 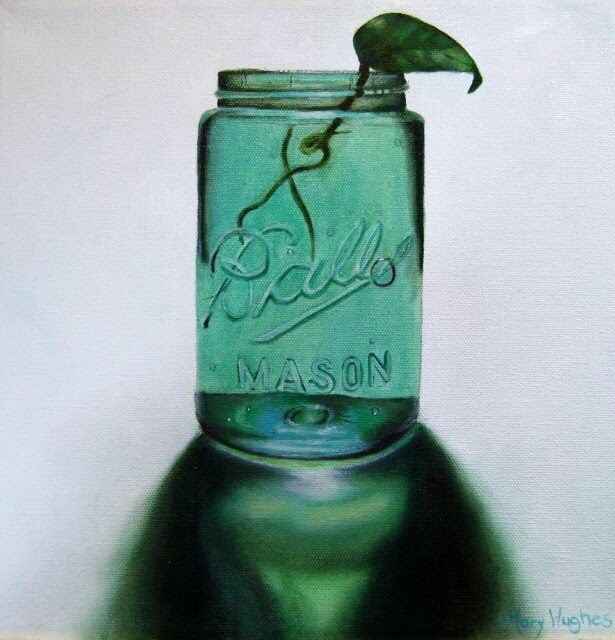 Dozens of still life prints available for purchase. More prints coming soon!! There's still time to order gift certificates for pet portraits too. Contact me via e-mail for more information. Now Available in Print in Time for the Holidays! "Ball Jar with Lemon", "Old and New", and "Striped Roses in Ruby Glass" can be purchased in photo quality prints in a variety of sizes. Contact me via e-mail for other print options or for other sizes and pricing. Have you found that perfect gift for the pet owner in your life? 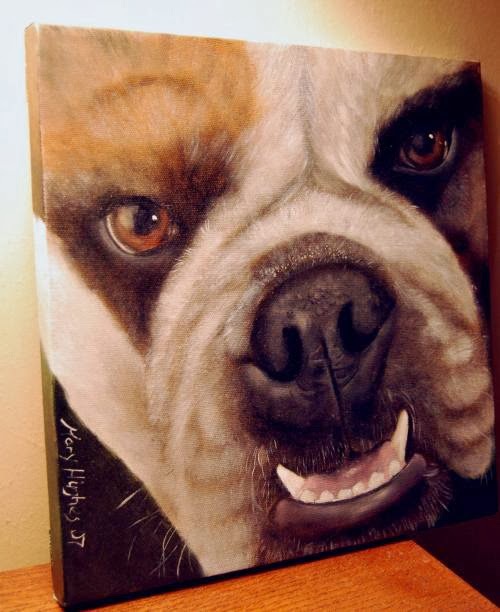 A hand painted pet portrait is one of the most personal gifts to give and it will be cherished for years. 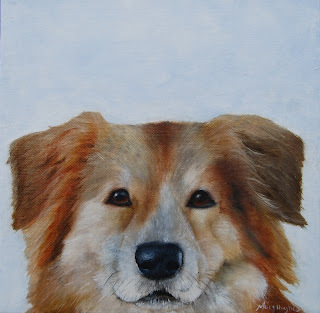 This gift certificate entitles the receiver to a 12" x 12" oil portrait of their choice of pet. If you've been thinking about having a portrait done of your own pet consider purchasing this gift certificate for yourself. Gift certificates can be sent as an e-mail to the receiver or choose to have it snail mailed. The certificate is good for one year (present - Jan. 2014) not redeemable for cash. Other sizes and prices available. Contact me for more information or to place your order. This demitasse cup and saucer is antique and belonged to my great grandmother. It's always been a favorite. 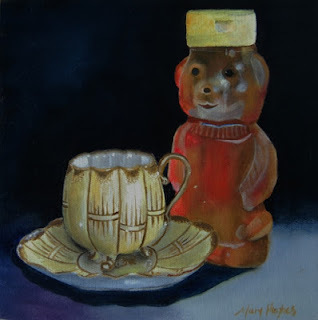 I decided to pair it with a honey bear. I have a green glass vase in this exact style given to me as a very young child. 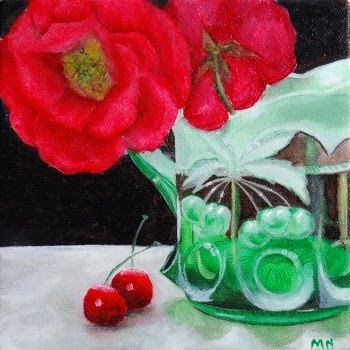 I've always treasured it so when I found this ruby one it seemed perfect for this painting. Pink and white striped roses sitting in a ruby glass vase makes for a vivid display. 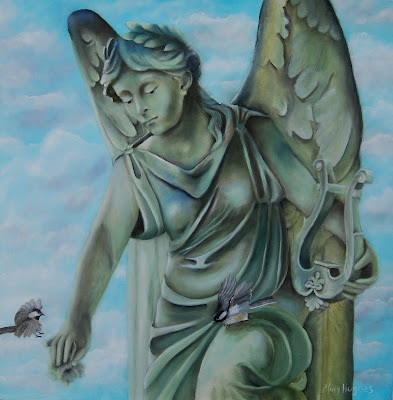 Two Chickadees are landing on the lovely angel statue. Soft puffy clouds float by in the background. Notice the little finger of the statue is broken off. She has been welcoming birds for over a century. This is a statue I came across one summer in Maine. I thought she was beautiful and that one day I would paint her. When I started I didn't have a plan particularly. This one seemed to carry me along rather than the other way around. Some paintings are like that, they seem to paint themselves. Others...not so much. This painting is available by clicking on the link below. 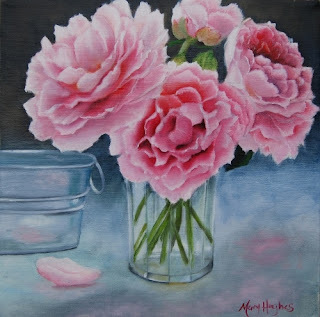 This still life depicts a bunch of freshly cut pink peonies from the garden and placed in a glass. A single petal sits on the table and reflects in the metal planter sitting nearby. I painted it feeling nostalgic for my pink rose painting days. Available for purchase. Click on the photo or title for more details. This dog has a depth of feeling in his eyes. That look he gives you when he is tuned into what you are doing, or when he wants you to be tuned into his thoughts and feelings. Intelligent yet soft. Connected. 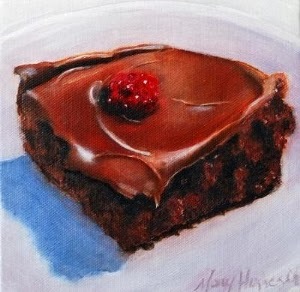 This painting is available in print version on metal, canvas, paper, framed or unframed. Click on the FineArtAmerica link above for more information. "Hi" 10" x 10" oil on stretched canvas. 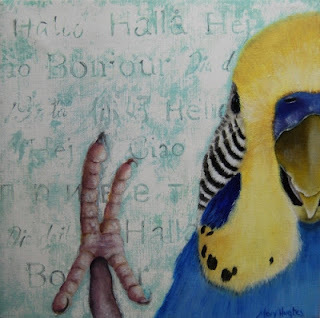 Having finished dozens of close up bird oil paintings over the years I decided to try something a little different, so this parakeet is showing his friendly side (they're all pretty friendly) and waving "hello" or "hi" to you. The word "hello" is spelled out in different languages in the background while his foot is giving you universal sign of "hi". 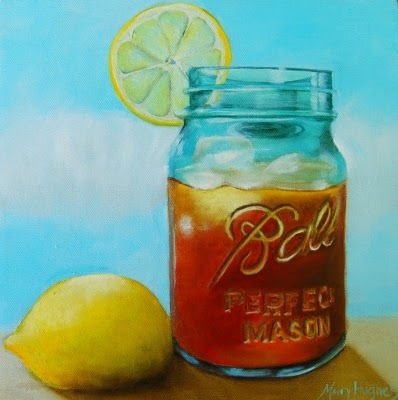 This painting is available and if you click on the image you'll land on the selling page.